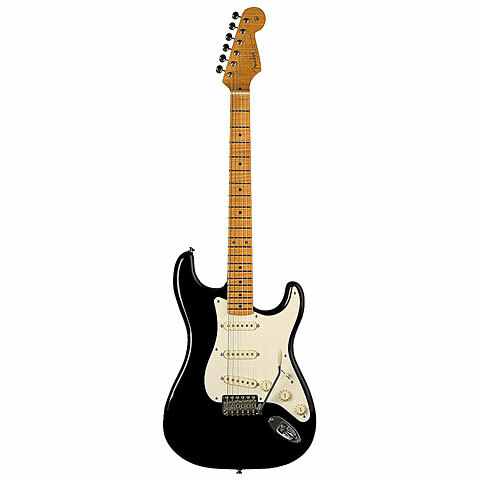 Fender built their first signature guitar for Eric Clapton, who was in the search of a second guitar to this beloved “Blackie”- the black Pre-CBS Stratocaster. He got a completely new custom-tailored instrument with a few individual refinements here and there and it soon became one of the top-ranked guitars among signature instruments. Artist Signature Series instruments have all the features that ordinary, mass-produced instruments usually do not provide and are replicas built true to the original which then go into serial production. Some guitars are available as more affordable models manufactured in Mexico or others as more expensive models made in the Custom Shop. It has been long awaited and now it’s finally here: The Eric Johnson Stratocaster. Built according to Johnson’s specifications and as it used to be common with older Strats, it features a widely-shaped alder body. It is dressed in a thin layer of nitrocellulous lacquer finish. Due to its one-piece maple neck being quarter-sawn, the grain of its wood runs vertical. In addition, the neck has a soft V shape. The guitar has been equipped with threaded vintage-style hardware which replaces string trees and the pickups are also wired according to Johnsons specifications. The result is s truly great guitar. This item was given an average rating of 4.9 out of 5 stars. No review about this product has been written yet. 10 ratings exist without a text or these reviews are written in another language.